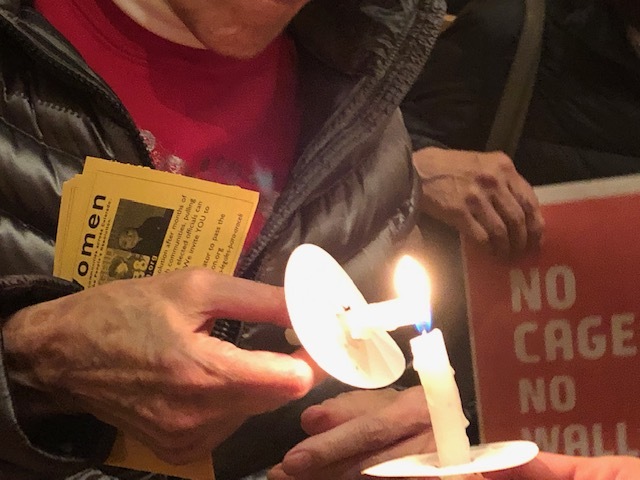 DENVER -- With major concerns looming about another government shutdown, two religious congregations hosted an immigration-oriented candle light vigil Sunday night. The interfaith event was called, "Our Lives are not For Sale." The two congregations, Park Hill United Methodist Church and Temple Micah, are part of the Metro Denver Sanctuary Coalition. Their event was to encourage participants to reach out to Congress, to ask for a "clean" budget and policies that create a path to status for immigrants. "We're not bargaining chips," said Park Hill UMC Pastor Nathan Adams. "Federal workers, immigrants, citizens, whatever our status might be, we're not folks to be bartered back and forth to try to get a deal done." Adams is urging elected officials "to create a moral budget that reflects and honors the sacred worth of all people." Araceli Velasquez, who has been living in sanctuary at Park Hill UMC and Temple Micah, said Congress should have a separate debate for immigration issues. "My family is affected by all these policies," she said. "My husband has temporary protected status, which the President is trying to end." Velasquez came to the U.S. from El Salvador, seeking asylum. After being detained for a month in Texas, she made her way to Colorado, met her husband, Jorge, and started a family. After missing an appointment with immigration officials, she lost her request for asylum, and is now waiting for another hearing, a hearing that could be delayed by a government shutdown. "We light a candle here in the sanctuary to remind ourselves of the light we're called to share," Pastor Adams said. After listening to several speakers, participants holding candles walked outside the church, toward Montview Boulevard, then north along Glencoe, to the other entrance. Inside, Rabbi Adam Morris asked participants to join arms. "Tonight, at this moment, we see with our hearts," he said. "We feel with our hearts, we hear our hearts." He asked that Congress make good choices. "May they make choices on our behalf," he said, "not with their fooling eyes, or their lying ears, but with their true, authentic heart, and see, and hear, and know in truth, that we are one."